Subic Bay, Philippines, has one of the highest concentrations of historic ship, aircraft and vehicle wrecks within sport-diving range in the world. Over 25 wrecks dating from the Spanish-American War to the Vietnam War have been identified in Subic Bay. 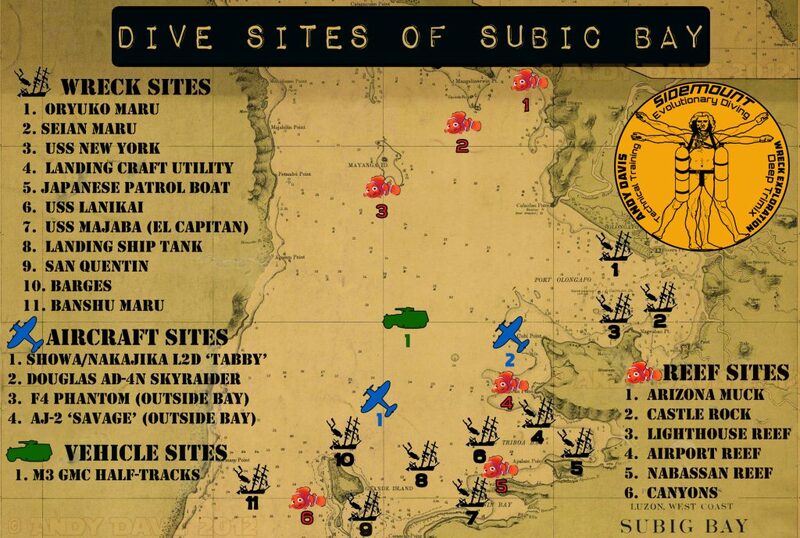 Ironically, these Subic Bay dive sites have only recently been opened to recreational divers, due to the existence of a major US Navy base at Subic Bay until 1991. For many years, the US Navy restricted access to the dive sites, banning all diving except by military personnel. It was only after the departure of the US military that wreck-diving enthusiasts were able to start exploring this treasure trove of history. The most popular of the Subic Bay dive sites, the USS New York is perhaps the most famous and sought-after wreck dive in the Philippines. It was built in 1891 as the second in a line of armoured cruisers, with the original designation of ‘ACR-2′ (Armored Cruiser no.2). Her sister ship, ACR-1, was later converted to a battleship and renamed the USS Maine. The sinking of the Maine instigated the Spanish-American War, in which the USS New York also fought. The New York was upgraded (including the turreted 8-inch guns) and became the flagship of the US Asiatic Fleet and Pacific Squadron. She subsequently participated in the First World War and other conflicts. Between 1911 and 1917 she was renamed ‘USS Saratoga’ and later, the ‘USS Rochester’. In 1933 she was finally laid up at the Subic Bay to be cannibalized for spares. She was eventually scuttled by the US Navy, in 1941, during their preparations to withdraw from Subic, to prevent her four 8 inch guns falling into enemy hands. Resting on her port side at a depth of 30m, she is still mostly intact, except for explosive damage caused by salvage operations in her mid-section. Fortunately for divers, her 4 massive turreted deck guns and enormous propeller are still intact. The wreck is 110m long, making it one of the largest wrecks in the Bay. Diving the USS New York is an atmospheric experience for divers and the scale of the wreck can really be appreciated as you swim alongside her main guns or around her propeller. Suitable for: Advanced Open Water / Experienced / Technical Wreck divers. Optimal Minimum Qualification: RAID Advanced Wreck Diver – get inside and explore the maze-like engine compartments. Commonly referred to as the ‘El Capitan’, the USS Majaba (AG-43) was built by Albina Engine & Machine works in 1919 and originally designated as the SS Meriden. On 23 April 1942, She was acquired by the US Navy as the ‘El Capitan’ and immediately renamed USS Majaba upon commissioning and conversion to a ‘miscellaneous auxiliary’ on 14 May 1942. During World War Two, she served with distinction providing vital cargo runs for the US Military. On her final cargo mission, between Tuglai and Guadalcanal, she was struck by a torpedo from a Japanese submarine. The impact destroyed her engine room and boilers, but she did not sink. Due to this damage, she was towed to Florida Islands, Solomons, was repaired, and spent the remainder of the war serving as a floating quarters and material storage ship. Following the end of the war, she was towed to the Philippines and eventually her name was struck from the Navy List on 28 March 1946. Whilst waiting at anchor in Ilanin Bay, Subic, to be returned to her pre-war owner, E.K.Wood Lumber Co., of San Francisco, Calif, she was sunk in a storm. The Majaba received one Battle Star for service during World War Two. It is a fairly conventional steam-powered freighter and her plate rudder design signifies that she was an older design of ship than most freighters used in the Pacific during World War Two. The existence of a large gun platform at her bow indicates her participation during the conflict, although the lack of any obvious explosive damage seems to indicate that she did not sink in action. Located on the edge of a shallow, sloping reef, the most likely cause of her sinking seems to be a collision. The wreck lies on its port side in a maximum depth of 20m, with the starboard side only 4m below the surface. She is approximately 3000 tonnes, 80m long and structurally intact. Divers can enjoy swimming inside her massive forward and rear holds and, if suitably trained and equipped, can enjoy comparatively safe penetration into her cavernous boiler room. The combination of good visibility, shallow depth, no current and intact structure makes this one of the Subic Bay dive sites perfect for novice wreck divers. Optimal Minimum Qualification: RAID Advanced Wreck Diver – the boiler room is very accessible, but ensure safety by using proper wreck procedures. Deliberately scuttled, in 1898, to block the entrance to Subic Bay during the Spanish-American war, the San Quentin is an impressive wreck and one of Subic’s most beautiful dive sites. Whilst it is mostly flattened by a combination of storms and time, the bow and stern sections are still easily recognizable, as are the large upright steam boilers. More than a century underwater has transformed this wreck into a thriving artificial reef and the dive site is covered with a luxuriant growth of soft corals, sponges and crinoids, and populated with a dazzling array of fish and invertebrates. Over 20 species of nudibranch have been identified here. It is an easy dive in only 12-16m of clear water. It is situated next to a pleasant coral reef, that is home to some very large specimens of Giant Clam. One of our most popular dives sites with underwater photographers and videographers. Perfect for: Underwater photography/videography, Historical/Heritage appreciation of the Spanish-American War. Optimal Minimum Qualification: RAID Advanced35 – some improved navigation skills can really help. This wreck is infamous due to the war crimes testimonies of the allied prisoners-of-war who were transported on her from Manila to Subic during World War Two. Originally a cargo liner, the vessel was utilized by the Japanese military to transport Allied prisoners from the Philippines to Japan. In addition to the horrific treatment of those prisoners during their transport, the Japanese also failed to mark the vessel as a prisoner-of-war transporter and she was subsequently bombed by the US Military. On 15th December 1944, she was sheltering in Subic Bay with a complement of 1,620 American and British prisoners on board. Caught in the bay by an American air-raid, she suffered heavy bombardment and was sunk close to shore. Over 300 prisoners died during the short transit from Manila and the sinking of the vessel. Of those who escaped from the sinking ship, the remaining majority subsequently died of harsh treatment, malnutrition and disease during their transport to Japan. Fewer than 200 prisoners remained alive when the Japanese finally surrendered and the war ended. Due to its history, the wreck often creates a sombre atmosphere in the minds of visiting divers. It lies only 500 meters from shore, near Alava Pier, at a maximum depth of 27 meters. It is mostly tangled wreckage due to demolitions to protect passing shipping. It often has the worst visibility of all the Subic Bay dive sites, due to its proximity to the outflow of the Kalaklan River. Perfect for: Historical/Heritage appreciation – a sober reminder of the tragedies of war. Optimal Minimum Qualification: RAID Advanced Wreck – low visibility experience and navigation skills required. The Seian Maru is a 3,712 tone freighter that was serving the Japanese Navy when she was bombed and sunk by US Navy Aircraft on the 19th December 1944, only 4 days after the sinking of the Oruyko Maru. She was built in 1938, with a length of 351ft and a width of 50ft, and served the Japanese Navy as an anti-submarine net layer and patrol boat, before being re-roled as an auxiliary tanker. During her time as an anti-submarine vessel, it is reported that she saw action in May 1942; dropping multiple depth charges near Ambon in the Moluccas (Indonesia), defending herself from air attack, and transported troops from the No.3 Yokosuka ‘Special Naval Landing Force’ from Timor. It now lies on its port side at a depth of 27m. It suffered severe damage to the midsection when it was sunk and the drama of its demise is evident from the twisted and torn metal of its hull. One of the less frequently visited dive sites, due to unreliable visibility and frequent restrictions from the harbour authority. Optimal Minimum Qualification: RAID Sidemount Diver – get more time to explore at depth with more gas at your disposal. Located in the same bay as the LCU wreck, this vessel sank during the Japanese occupation of Subic during World War Two. The wreck stands upright at a maximum depth of 26m and is structurally intact. The exact vessel type and purpose of this ship is not known, but with a length of 120ft, a breadth of 25ft and weighing around 150 tons, she was most likely employed as a tug boat or submarine detection vessel. It is one of the most pleasant dive sites, as the wreck attracts a large amount of marine life and typically enjoys good visibility. Optimal Minimum Qualification: RAID Advanced Wreck Diver – some basic light zone penetrations, and wreck layout and navigation certainly helps to get the most out of this wreck. Following the end of World War Two, Subic Bay was utilized by the US Navy as a base and training area. US Marines regularly practised amphibious assault techniques here and, occasionally, the landing craft used for that training became accidental casualties. The largest of these sunken assault craft is the Landing Ship Tank. The Landing Ship Tank (LST) was created during World War Two for the purpose of supporting amphibious operations, by carrying large amounts of vehicles, cargo and personnel directly onto the shore. More than a thousand vessels of this type were commissioned by the US Navy. 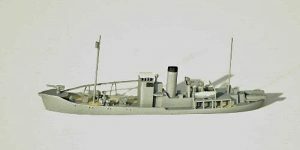 The basic design for the LST required a vessel capable of ocean travel, yet with a shallow draft for beaching operations. The ultimate design incorporated a variable ballast system, a length of 100m (328ft), a 15m (50ft) beam and minimum draft of 1.2m (3.8ft). With an unloaded weight of just 1780 tones, this scheme served to distribute the ship’s weight over a large area, allowing it to float higher in the water for landing. They could accommodate all types of Allied military vehicles and later production designs could also house and deploy a landing craft utility (LCU) or landing craft tank (LCT) from its main hold. She could transport over 2200 tonnes of cargo, men or machines. Her crew complement was 8-110 officers and 100-115 sailors. This 100-meter long vessel was deliberately scuttled in 1946 and now sits upright in the centre of the bay with a maximum depth of 36m. Her giant bow doors have dropped away to the sea floor, although her main loading ramp remains raised. Along her bow and mid-section, the wreck is intact and contains a football pitch sized vehicle loading deck, which is easy to penetrate at each end. Her forward gun platforms (for 1x 3″ gun and 2x twin 20mm guns) remain in place. The top decks of her stern (rear) section have collapsed structurally, although the tangled wreckage attracts a wealth of marine life and schools of large barracuda, jacks and fusilier are common here. One of the best dive sites for reliably good visibility. With luck, visiting divers may be treated to a swim-past by the bull shark that inhabits the deep sections of the bay. Optimal Minimum Qualification: RAID Deco40 – a little extra bottom time and more available gas gives you the chance to properly explore the full length of the vessel. Another post-war amphibious assault wreck is the Landing Craft Utility. There were many variants of utility landing craft designed and built during World War Two. This vessel type was used for transporting personnel or small vehicles onto beaches. The example dived in Subic Bay was actually designated as a ‘Landing Craft Tank’ (LCT6). Vessels of this type could be stored and operated from the larger Landing Ship Tank (LST) vessels. It is believed that this wreck was sunk due to accident/storm It one of the most sheltered dive sites, as it is protected from rough water inside Triboa Bay, close to the end of the main Subic runway. It sunk with its large forward ramp still raised and it lies upright on a sloping bottom with a maximum depth of 22m. The wreck is now home to a collection of lionfish species, along with predatory jack schools and many reef fish species. There are two gun platforms at the mid-section and several rooms that offer short penetrations towards the rear. The vessel is intact and it is easy to gain a comprehensive appreciation of her features in a single dive. One of the most popular Subic Bay dive sites with novice divers. More information on the Landing Craft Tank (LCT). Optimal Minimum Qualification: RAID Open Water – a small wreck, easy to navigate and undemanding for novice divers. WWII Spy, movie star and known to the rich and famous – this remarkable wreck is steeped in history. The schooner-rigged diesel powered yacht was built in 1914 and originally named the ‘MV Hermes’ and sold to German owners. It was at dock in Honolulu at the start of WWI, so was confiscated into U.S. Navy service by executive order and renamed the ‘USS Hermes’. She served the Navy for the duration of that war, operating as a submarine patrol vessel and general intelligence-gathering patrol craft around the Hawaiian islands. After the War, she continued in official service, firstly with the Hawaiian Government as a tender for leper colonies and then as a store ship and general auxiliary for the Pacific Air Detachment. She was sold, and re-named ‘Lanikai’, in October 1926 to the Lanikai Fish Company and then passed through several ownerships until, in 1937, she was sold to Metro-Goldwyn-Meyer (MGM) film company for filming in the movie ‘The Hurricane’ (starring Jon Hall and Dorothy Lamour). After filming was complete she remained in use as the MGM yacht, until being sold to the Luzon Stevedoring Company in Manila. With the start of hostilities in WWII, she was again commissioned into US Navy service, on the 5th December 1941, and served with distinction during the conflict – earning a ‘Battle Star’ in recognition. Upon entering military service, she was fitted with a vintage (Spanish-American War era) 47 mm gun and two .50 calibre machine guns. She was initially ordered to conduct top-secret intelligence patrol activities around Cam Ranh Bay, Vietnam, as part of a US Navy plan to use “small vessels to form a defensive information patrol… to observe and report by radio Japanese movements in the west China Sea and Gulf of Siam”. However, the attack on Pearl Harbor made that irrelevant and she remained in Manila Bay where she survived a devastating Japanese air-raid on Cavite Harbor on the 10th December and took part in the evacuation of military forces from Manila to Corregidor Island. After the Japanese invasion, she took part in an amazing and brave escape from the Philippines, hoping from island-to-island, via the Dutch East Indies, to get to Australia. She was crewed with three US officers, one Dutch officer and a compliment of 15 Filipino sailors. Under constant threat from the enemy fleet and patrol aircraft, she spent 82 days – island-hopping at night, hiding during the day – evading Japanese air and sea patrols. She was bombed once, near Java on the 3 February and was lucky to survive, as 3 Japanese bombs straddled her. She eventually arrived in Freemantle, Australia on the 18th March and spent the next 5 months as a patrol vessel on the north-eastern coast, before ownership was transferred to the Royal Australian Navy, who utilized her for harbour defence for the remainder of the war. When the war ended, she was due to be returned to her original owner in Manila and sailed to Subic Bay for maintenance and repair prior to handover. Sadly, after so many heroic exploits during the war, she was sunk by a typhoon in 1947. Her wartime exploits are recorded in the book “Cruise of the Lanikai: Incitement to War” by Rear-Adm Kemp Tolley. The wreck lies scattered at a depth of 36m, but much of the structure is still recognizable and attracts a lot of marine life. She was only re-discovered in Nabassan Bay by local divers in 2003. Many interesting artefacts were salvaged from the wreck and are now displayed in the local maritime museum. One of the less frequently visited dive sites, due to the depth. Perfect for: Historical/Heritage appreciation, An interesting log-book entry! Optimal Minimum Qualification: RAID Deco40 – more bottom-time for proper exploration and make a safe and conservative ascent on the shot line. The Kyo Maru was a whaling vessel before being requisitioned into the Imperial Japanese Navy to serve as an auxiliary anti-submarine vessel during WWII. She was believed to have been sunk by US Air Force P-40 ‘Warhawk’ aircraft on the 2nd March 1942. The wreck lies broken into two sections at a depth of 69m, making hypoxic trimix qualification a necessity for visiting her. It can be found a few kilometres north of Subic Bay, along the Luzon coast. She attracts a great deal of marine life, and there are many interesting features to find in her wreckage. The Banshu Maru was sunk by a mine on the 20th January 1942 in the entrance to Subic Bay, alongside Grande Island. She was a civilian vessel requisitioned into service in the Imperial Japanese Navy as an Auxilary Minesweeper (N0 52). The wreck measures 37m in length and the deck rises 4m above the seafloor. Under the command of Reserve Lt. Uchida Shoji, the vessel was engaged in clearing a US Navy laid minefield that blocked the channel into Subic Bay, when she was hit and sunk – shortly after US forces abandoned the base and retreated to the Bataan peninsula. Optimal Minimum Qualification: RAID Deco50 as trimix makes a huge difference in narcosis management and gas density at this depth. One of the few aircraft wrecks available in Subic Bay, the F4 Phantom is a relic of the US Navy’s long and active involvement at Subic Bay. The F4 Phantom is a supersonic (Mach 2.23) two-seat, twin-engine interceptor/fighter/bomber, that entered U.S Navy service in 1960, later being adopted also by the U.S. Marines and Air Force, along with several other national air forces, including the RAF (I remember the RAF Phantoms being serving out of Cyprus in the late 80’s). 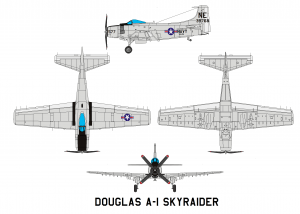 The aircraft served with distinction during the Vietnam War. It was last used operationally during the 1991 Gulf War in an anti-radar/air-defence suppression role, before retiring in 1996. The F4 Phantom was very high technology for its era, fitted with an advanced Doppler radar, impressive payload options and having an airframe mostly composed of titanium. The wreck lies several kilometres outside of the bay, at a depth of 45m/147ft. Visibility is consistently good and there is light-moderate current. Because it lies beyond the protection of the Bay, it cannot be dived in rough/stormy weather. I believe this aircraft wreck is an air-frame discarded from a carrier ship. Having examined the structure, the J79 engines are not present. There are no ejection seats and the canopy is missing (allowing divers to sit in the pilot’s seat). Perfect for: Technical divers looking for something different / Technical training courses. Optimal Minimum Qualification: RAID Deco50 – opens up substantial bottom time, with accelerated decompression for a ~60min run-time. This Japanese WII aircraft wreck was only discovered in late 2013. The Tabby was a DC-3 Dakota / C-47 Skytrain variant produced under license in Japan pre-war and used extensively during the war. During the Japanese occupation of the Philippines, the Japanese operated Tabby aircraft from numerous locations, including Clark Field near to Subic Bay. There were war-time reports of at least 9 Japanese aircraft being shot-down over Subic. The wreck lies inverted at a maximum depth of 45m. 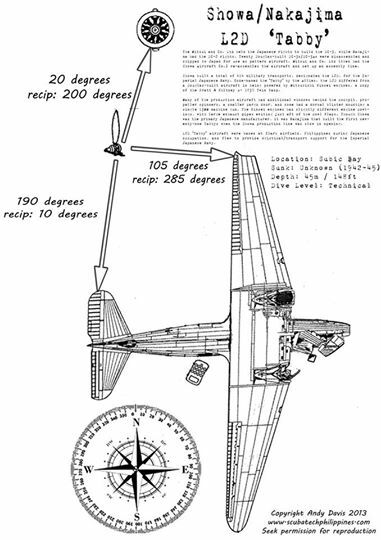 It shows considerable damage to the cockpit area, but divers can identify the pilot’s seats and control sticks. The fuselage section is intact, with the side-door removed. Inside the aircraft is a great deal of fish life, including a large buffer and grouper. The engines tore away from the aircraft on crashing – and the remains of one engine and the propeller can be located a few meters north of the wreck itself. See some photos of the wreck here and an account of the identification process/dives here. Perfect for: Historians / Technical training courses. Optimal Minimum Qualification: RAID Deco50 – you will want at least 25-30 minutes at the bottom to explore this fascinating aircraft wreck. The AJ Savage (later A-2 Savage) was a carrier-based medium bomber utilized by the United States Navy. The aircraft was designed shortly after World War II to carry atomic (Mk4) or conventional (5400kg payload) bombs. 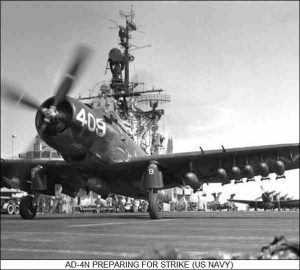 At the time, it was the heaviest aircraft to operate from an aircraft carrier. It was powered by two piston engines and a turbojet buried in the rear fuselage. In later service, photo-reconnaissance (AJ-1/2P) and air-to-air variants were operated. The wreck lies upright at a depth of 72m, a short distance west, outside of Subic Bay. It is surrounded by much marine life and the aircraft itself is largely intact. Due to the depth of the wreck, advanced trimix qualification is necessary. The Skyraider, affectionately known as the ‘Spad’, served with the US Navy in many roles, from the late 1940’s until the 1980’s. Our variant in Subic Bay is the 3-seat night fighter version. It is armed with four 20mm cannons and numerous hard-points under the wings for bombs, rockets or extra fuel tanks. The wreck sits upright at 36m and is virtually intact, except for a missing propeller. Inside the cockpit area, all of the flight controls and instruments are recognisable, The radar operator’s parachute can still be seen in the rear fuselage. Two M3 GMC Half-Track Artillery vehicles lie mysteriously in the centre of Subic Bay. 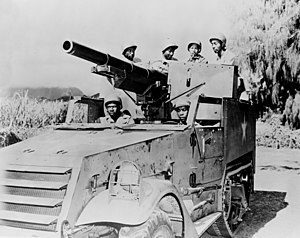 These vehicles would have been operational during WWII, and probably saw action during the liberation of Subic Bay from the Japanese. The two vehicles are laying very close to each other in 38m depth. 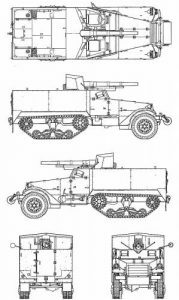 The tracks, forward wheels, steering controls and large 75mm guns are easy to identify.